I just purchased the bear today at an estate sale. They told me he is a Steiff but I don't think he is. He has some unique characteristics such as cardboard inserts in his feet. He has a longish muzzle but does not have a dish in his face. If almost seems to slope right down from the top of his triangular head to his nose. His nose may or may not be original stitching. It is stitched vertically with 2 center stiches that come down and his mouth stitching runs through the two stitches that come down. His mouth is quite crooked which leads me to believe maybe the owner restitched it. I believe the eyes are antique shoe or boot button with round loops on the backside. It appears that they may have resewn one of the eyes up higher on the head than originally sewn. There seems to be an indention lower than where the eye now sits. The eyes are black. The bear is 12" tall from the top of his head to the bottom of his feet. I feel the bears most distinguishing features are the shape of his head (his sideview) and his foot pads and stitched paw claws (though the stitching may not be original to the bear). The stitching on his hand and foot paws include 5 stitches on each paw almost converging in the center. What do you know about the bear i.e. what is the bears back story? Please tell us as much as possible. I know nothing about the bear. I purchased him at an estate sale today and the home was filled with items from the early 1900's. 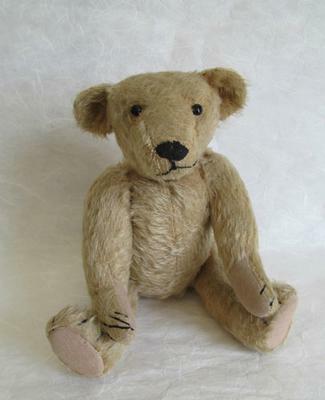 The lady running the sale told me it is a Steiff bear but I believe they think all antique bears are Steiff bears! Well I have gone through my books and I can't place him. I suspect that his head may have lots of work as his profile doesn't match anything else I have seen. The sloping nose like that does not really fit with bears from the early period. I would expect a much more defined nose. 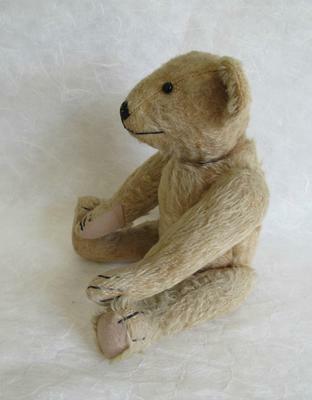 The button eyes, stuffing , long arms etc do correspond with early bears but unfortunately without labels or provenience it is very difficult to identify especially if repair work has been carried out also. Sorry. I'm pretty sure u have the exact same bear.. it's been in my family for years and I'm pretty sure it was my nannas handed to my mum now to me. It has a little pin prick hole in an arm and a bit bare of fur in a couple of places. Is it worth restoring.. or would it wreck the bear? What would the value of it be? I was thinking of getting a glass box made to protect it. I would do research on the Bruin Manufacturing Company. Their bears resembled Ideal teddy's but had cardboard foot inserts. I think that is who this guy is. Avec toutes les photos que vous avez prises de votre ours vous pourriez les envoyer au Musée pour identification.
" La Nef des Jouets"
With all the pictures that you took of your bear you could send them to the Museum for identification. Thank you so much for helping me to identify this little bear. I sold him on eBay, so he's no longer in my possession. I hope his new owner knows how lucky she has to have such a gem! Hello, Janice. I do think Your old bear is an Ideal. bear. I can see his drumstick look of his legs. Please compare his over all look to the famous Smithsonian bear. He is Ideal too. See his shoulders, ankles, legs, neck. Does your bears neck slope down. Because of the large metal joint the Michtom's used in their early bears. As time went by this large joint pushed down on the stuffing in its lower neck causing the bears to slope their necks a hundred years later.By 1910 Ideal bears no longer had stitched claws on their feet and paws. I date your bear at 1906. Because of its flat feet. Now the color of the bears foot pads look champagne. This color was used on Michtom's early bears. Now your bear has the longer arms. A very early Ideal advertisement, says why buy the import bear when our bears look the same. So I think Morris Michtom made his bears look similar to its German competition. By having longer arms at this time. 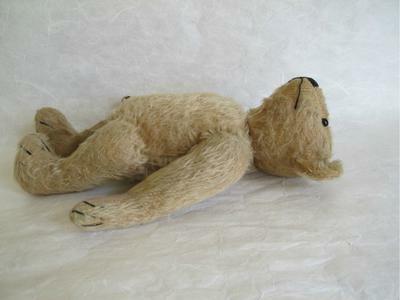 A very early production bear of the Ideal Novelty and Toy company. Please look at this web site, Tracy's Toy's. She too has an early Ideal bear like yours. To compare to. Hi there, Your bear looks like an American bear made by the Ideal Novelty and Toy Co.